We Are International Distributors, Exporters & Wholesalers - Located In Nova Scotia, Canada. "Pine is ideal for that rich distinctive look... pine ages to a beautiful golden tan over time"
Knotty Pine Stair Parts are full of rustic character with its non-uniform grain, semi clear apperance and knotty look. Pine has a rich distinctive character in both colour and grain. Although generally clear, a limited number of small structurally sound knots are permitted in pine stair parts. Pine is very attractive since it will varnish to a rich golden colour and age over time to a more golden look. Pine is relatively easy to work with and the wood is comparable to hardwood species such as Oak for strength. 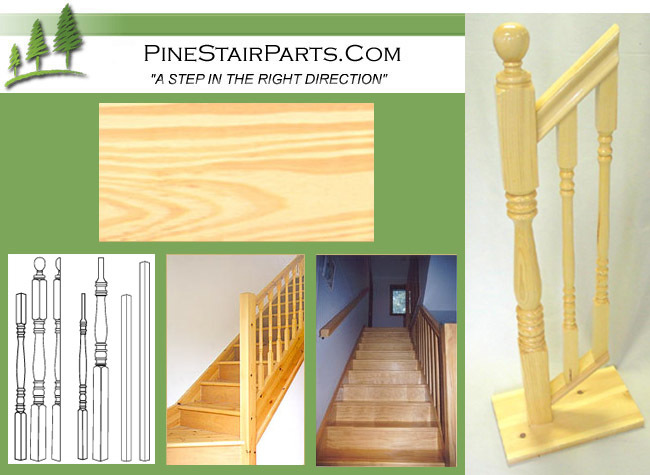 Pine Stair Parts offer flexibility at an affordable price. Whether natural, stained or painted, pines distinguishing characteristics and open grain texture allows choice without the compromise when creating that award winning look of character. Click Here For More Selections Of Knotty Pine Stair Parts - Box Newels, More Turned Profiles, Etc. Customers Looking To Source Quality Pine Stair Parts... Contact Our Sales Team Today! PineStairParts.Com © All Rights Reserved - Suppliers of High Quailty Pine Balusters, Pine Newel Post, Pine Handrail, Pine Stair Treads & More.